Learning Games and Resources Bundle! For home: Ideal for homeschoolers and families interested in learning together. For Classrooms: Differentiated learning, a variety of learning styles represented, this bundle makes it easy to give your students their best opportunity to learn! For Schools: We offer a multi-classroom license bundle so your whole school district can use these resources. Free "How To Draw The States" eBook! I want you to fall in love with these resources! So I'm going to give you a big eBook to enjoy with your students. "How To Draw The States" gets your children very familiar with the borders of each state in the US. This is a PDF download that is available for you to start using immediately! Around here at Little Learning Lovies, we say you can "Print and play right away!" and this resource is no different. I truly hope this free eBook is a blessing to the children you teach! But I'd sincerely love to share even more with you. Let's work together to help your students achieve mastery over this subject. Keep reading to find out more! Printable PDF for your personal use only. We never spam! We'll add you to our email list if you aren't on it already and send you only awesome stuff from Little Learning Lovies. Account Access to all files in the bundle. Get automatic access to all additional files we add on later at no additional cost. Forever! For use in ONE family household or classroom. 10 copies of the BUNDLE CD shipped to you with 19 files. Can be used by 10 families/classrooms/co-ops. Lifetime access to the downloads through your account. What's In The Bundle Right Now? If your kids love to play UNO! they'll really love winning at US Geography UNO! Match borders to regions to capitals to state names and enjoy all the fun of wilds, skips, reverses and more as you play this fast and exciting game. So easy to learn the rules, different ages and abilities can play together, winning mastery of US Geography as they do! Many kids really enjoy doing word searches and this big set of US Geography searches has them really using their knowledge to complete the puzzles. There are different types of puzzles. For example, the clue might be the shape of the state, and kids have to find the name of the state or maybe the name of it's capital! Or maybe the clue is the state flag! HOURS of puzzle fun, here. State by state, kids use the grid method to learn... REALLY learn... the shapes of the boarders of all 50 states. These are a great way to introduce each state. After the state is drawn, you can even have them add in large physical features and important cities! For your younger learners… Practice handwriting, tracing, coloring and letters while learning states, capitals, flags and boundaries! Quickly identifying and understanding the region where a state exists can vastly improve your ability to understand news and politics and so much more! Use a paper clip or clothes pin to “Clip” the region each state belongs in! After all, learning the states is a whole lot better when you know where they exist on the map! There is a LOT of history on those flags! These flash cards teach the flags with their state and the shape of the states border. There's a lot to learn from these beautiful cards. Build the map! The gray map mat is 8 pages! You can just build it, or you can put each state up as you study it. This takes an old but fun game and adds a new element to it. Instead of matching cards that are exactly the same, your goal is to match a state border with it's capital city! The card shows you the border and state name. Then you have 5 flag choices! Can you use a paper clip or clothes pin to clip the correct flag? These are such a fun way to practice! By using IMAGES as clues, kids get to practice their skills in a fun way. Try filling in the state names based on the state flags as clues! Or how about the state borders or their capital cities? These clip cards present your child with the name of the capital city. The challenge is to use a clothes pin or paper clip to "clip" the border shape that matches the capital! You might have noticed that this page is REALLY Long! I want to make sure you know all about every item you're getting in this set. If you're tired of reading through the descriptions, though, you COULD just go grab your FREE eBook or, better yet, choose to buy the bundle right now! Like the previous memory game, this one asks you to match the flag to it's state border. This memory game is made slightly easier because both the flag card and the border card are labeled with the name of the state. This game is good to play near the beginning of your studies. For all ages, this challenge helps kids learn the shapes of the states! Great to use early on in their experience. These puzzles teach border shape, name, capital and flag! Write Trace and Color CURSIVE Edition! These are called "Strip" puzzles because the pieces are all straight strips. SUPER easy to cut! (You're welcome!) But also really challenging. Combine two or three states into a bag and you've got the makings for a great "at your seat" activity. And the kids will KNOW how to spell each state name while they reinforce the border shape, capital and flag! This is such a unique game: Each pocket has a state border on it. You hide puzzle pieces inside SOME of the pockets. Kids point to a pocket, say the name of the state (or the capital... You pick!) and if they are correct they get to check that pocket for a hidden puzzle piece. When they find them all, the game is over. It's so much fun, you'll play this over and over again! Same as above, only here they look at the state flag and name the state (or the capital). So much fun! Over 300 pages of learning activities in here! This journal helps kids discover great things about each state, pretend they are planning a trip to each state, and even gives space to record actual adventures if they really DO get to travel! 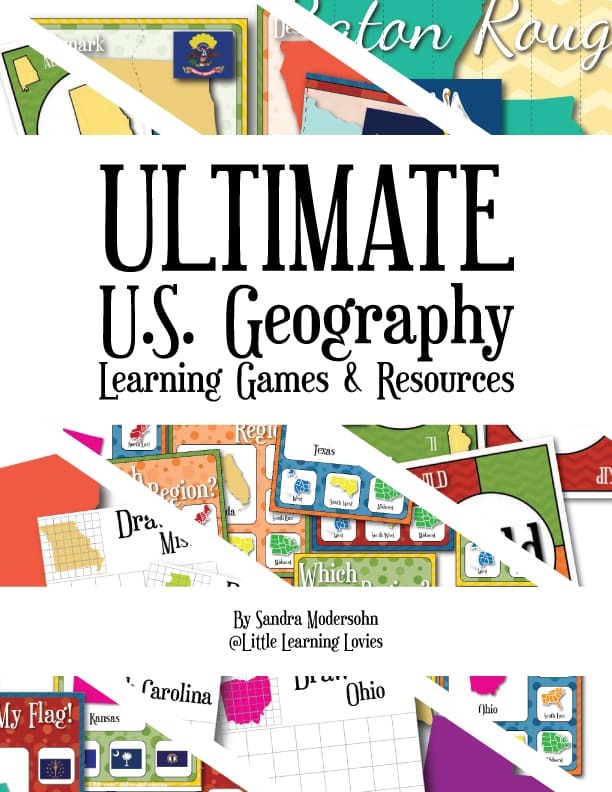 BUY YOUR US GEOGRAPHY BUNDLE NOW! I personally guarantee you'll love it. You have NOTHING to lose... It's time to HAVE FUN! "There aren't just one or two things in here that I can use in my classroom. I'm using nearly all of it to reach kids of all different learning styles and abilities! Thank you!" "I want to play that again!" "You just keep making it better with all the new things you add in. I thought you were done and then you surprised me with ANOTHER great resource!" US Geography can be FUN! You know your kids are going to LOVE learning with this bundle. You'll love being the awesome mom or teacher who plays all day! Every file is incredibly high quality so it will print beautifully! You'll use these over and over. They are actually WORTH using your good paper, ink and laminate! Most people selling printables don't do this, but I want you to be completely happy and confident. I want you to download your files and look them over. Get them printed and set up. Use these resources for the first week RISK FREE. If you contact me within 7 days of purchasing and let me know that these printables are NOT what you expected, not what you wanted, will not work for you at all, I will give you a full refund!